A tree commemorates the one thousand Russian ANZAC`s who fought at Gallipoli and the Somme. 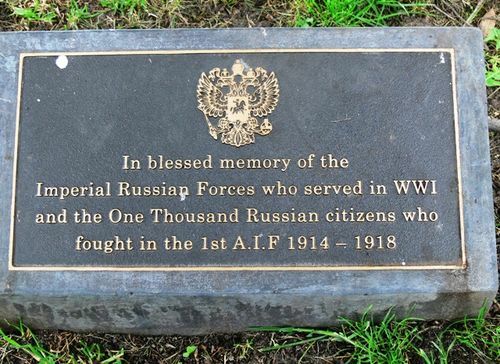 As World War One was declared there were several thousand citizens of the Russian Empire living in Australia. As young Australians lined up to enrol, young Russians sought permission from the Imperial Russian Consul, Mr A. N. d`Abaza, for a licence to also enlist in the First AIF. The thousand men who went away fought with distinction, winning nine Military Medals. During the Battle of Pozieres an entire section of the 9th Battalion was made up of Russian-born soldiers.